If your Visiting Daman- the only point which you would have to walk, if you are a tourist would be this stretch between the 2 parts of Daman. 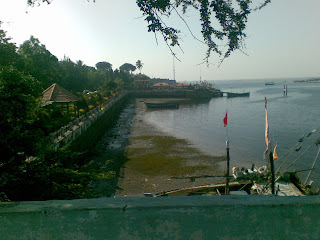 The most hep part of Daman is the place where Devka beach is. The other part is a lazy Jampore beach. We reached Vapi at 1 : 50 am, thrown out by a mob of irate travellers who wanted to get their inchspace of the unreserved compartment to Gorakhpur. I was happy to be out in one piece. We took a taxi, an Ambasador vehicle at 2 am, after a warm cup of tea. The taxi had 10 people inside and we had 3 in front and 7 behind absolutely cramped. 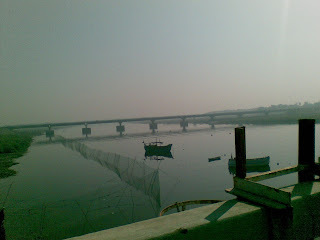 The taxi goes past the Daman-Gujarat Border and drops you at Daman Market. 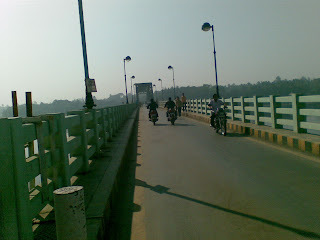 If you need to go to Devka beach, then it takes another 90 rs, and 6 kms to reach there. We took a hotel called Dariya Darshan, and decided to indulge in some luxury by taking the costliest room, as it promised ' sea view'. After we paid the money, a casual conversation at 2 30 am revealed that the sea view would be hampered by 90%, as a new building had come between the sea and the Dariya darshan hotel. We were too tired to argue, and we hit the sack. The next morning, we got up and discovered that the promised Devka beach had its sea 2 kilometres from the hotel, as the sea face was full of rocks, akin to the Bandstand at Bandra. At that side of the place, they do have a man made lake and an amusement park, but if you are a traveller in search for more realistic things, you would do well to avoid the devka beach side of Daman. I probably guessed, on our way to the other side of Daman, this would be a picture worth shooting at sunset. Jampore beach is the best part of Daman. It actually has a beach, which has this earthly element called Sand, that was missing in Devka. 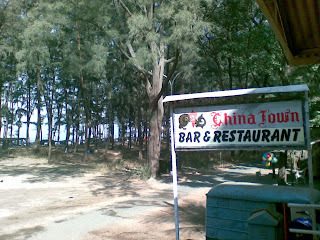 Jampore has small stalls around the beach, and waters that dont have too many strong waves. The downside to it is, the lack of accomadation options around the beach. The only proper restaurant is China Town which is barely comestible. There is intense competition in this restaurant for its 2 toilets that people flock to relieve themselves.